You've not said what printer (and any mods) or the size of the parts, and without that its going to be difficult for anyone to comment more specifically. The Prusa i3 Mk3 is supposed to be capable of interrupted printing, however, I appreciate you want to use what you have, so that comes back to the above issue. imho its not very advisable to have a extended pause time on any part print. the section already printed will cool entirely (and dependant on what form of material you use also undergo chemical changes) meaning that it will inevitably change dimensions (albeit only microns in most cases) enough so that the renewed print run will very likely be distinctively out of alignment which inturn will effect the performance and strength of the finished part. In theory however its easy to accomplish what your asking. essentially you'll have two separate prints, one thats sat on the printer build surface and one thats floating above, print the first onto the build surface then without removing it when done start the second, IF your printers well calibrated AND the first part hasnt shifted to a great extent then the second part should print directly onto the top of the first part, in general terms its two completely separate print jobs which means there's no need to add in any sort of extended pause via console or g-code and your printer could even be entirely shutdown between the two print runs. as I said though....its dependant on printer quality/setup precision and whether the first part shrinks or shifts between prints, a good tip would be to use some form of print surface that has reasonably good adhesion even when cooled as you wont be able to rely on printbed heat to hold the first part in place while the printer is off. im currently printing pla and havent had any issues with making sure the machine is well calibrated and my prints thus far have all come out well. i like the idea of slicing it into seperate print jobs i will run a test on this at the weekend to see how i get on. nothing to like yet, this is still early stages. iv just about finished figuring out the exact flight components i need to source. tho im currently lost in the math for thrust requirements. doesnt help i dont know what the auw will be yet. 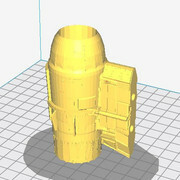 I should be starting printing this weekend on some of the smaller parts.